New installment of the most famous thief series. 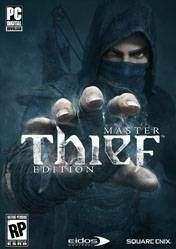 This edition includes: Digital Art Book, with which we have access to an amazing collection of drawings arts, a preview into the dark world of Thief. A digital comic book, with which delve into the history surrounding the dark world of Thief. Booster Pack, you will get access to a unique set of consumables in game that will enhance our skills and accelerate our progression through Thief. And finally, all the digital game soundtrack.